I was beginning to think I was the only one noticing, until a friend mentioned that she noticed that people are not communicating with each other as much these days. I know that might seem like an odd statement with all of us connected via social media, texting, and emailing all the time, but it really does seem that something is being lost in today’s media rich-world with personal communication. When communications break down between people, it can lead to hurt feelings, fights, distrust, and eventual disengagement between the parties. Not surprisingly, this also happens between our dogs and between our dogs and us. In this blog, I want to look at some examples of how to communicate better with each other and with our dogs. 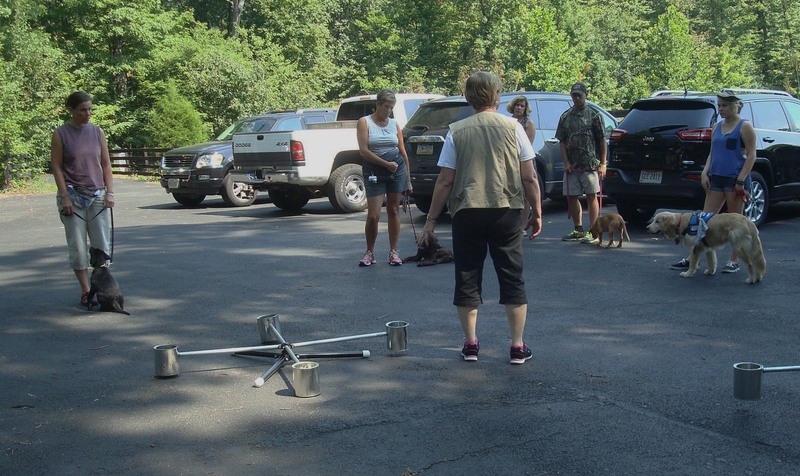 As a trainer and instructor, I am in a position where I must be clear with my clients and students as to what I need them to do with their dogs in order to be successful in either handling the dogs or training them. What is more important in my mind is that we are clear in communicating to the dog what we want or need them to do for us. One common mistake I see is that the leash handling is telling the dog one thing while the human is saying something opposite of the intent of the leash handling. When teaching the dog to walk on a loose leash what I most often see is people with a death grip on the leash and so much tension the poor dog is sure there is something wrong. When I mention this to people they realize the dog’s leash is taunt in their hands and give some slack only to wrap the remainder of the lead around their hand! If the lead is not totally loose and held in a relaxed manner the dog will not learn to walk on a loose lead. To show people what I mean I will take the lead from them, gently drape it over my fingers with my arm very relaxed by my side and take off walking. Many of the previously tugging dogs will simply go along and follow me, some might take off in which case I can grip the end of the lead before they jerk it out of my hand and turn around and walk off in the opposite direction from which they were headed. After 4 or 5 minutes of this, almost all dogs will begin to walk beside me with the leash very casually draped over my fingers. No tension (person) = no tension (dog). Another common miscommunication I see is with the word DOWN. English is a difficult language for humans, let alone dogs that are trying to learn it. You need to establish one meaning for the word and STICK TO IT! I have to emphasize that last point, as this is where the problems really occur, if you teach it to mean one thing then start adding in nuances that you want the dog to understand. They just don’t well with things like that so keep it simple. I like to teach “DOWN = go into a position where your body is lying down on the ground.” I use OFF instead of DOWN for “get off the furniture or off me,” etc. The last common miscommunication I see is people not reading their dogs correctly. 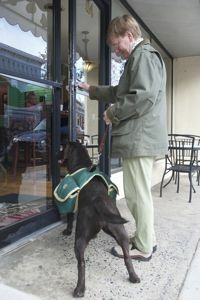 With the medical alert dog training a key part of the training is to teach the dog to give a very clear signal that an “event” is happening with their person. For a diabetes alert dog this would be a change in blood glucose, for example. This alert needs to be clear and unmistakably related to the event the dog is trained to alert to. What often happens however is the dog is trying to tell the person what is happening and the person is not paying attention. If, for example, your dog never bugs you about anything and all of sudden starts to pester you, your first thought should be he/she is trying to tell you something. Many people miss this and believe the dog is trying to be a pest. I see this all the time with housebreaking issues with puppies but it is particularly critical with the medical alert dogs. To overcome this situation, start from the beginning of training to set limits on how and when the dog can touch you. You would not want an alert dog to have a trick of “give me your paw,” or a cue to go outside to relieve themselves by pawing at you. 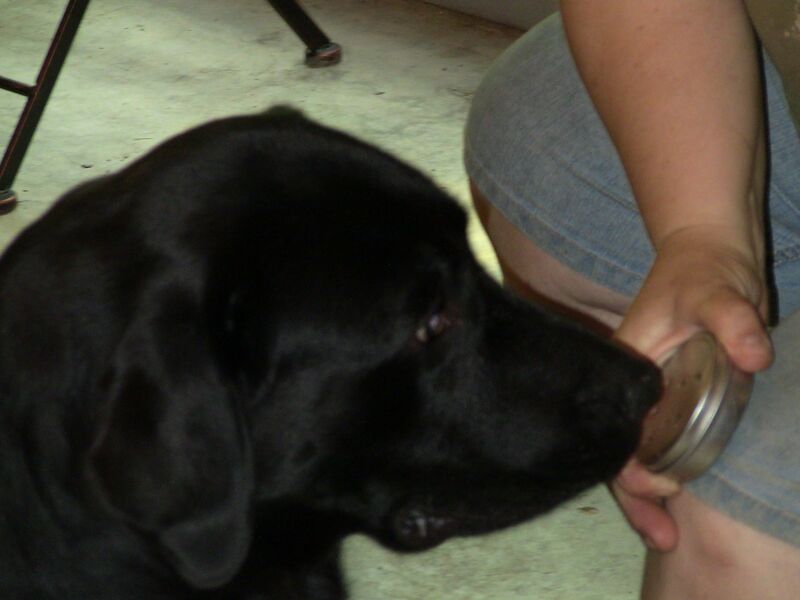 In training the medical alert dogs, save any bodily contact with you for their work. If this rule is adhered to, you can be assured if the dog then comes to you he is telling you something is not normal. Recently I got a message from a trainer in my program about a diabetes alert dog. The message relayed that the dog jumped up on her person’s bed (which she is not allowed to sleep on) and started licking the mouth of her person and pawing at him to wake him up. He did not get up, but the commotion woke up someone else in the house who did get the person up. When the glucose level was checked, it was quite low. This was good communication on the part of the dog, clearly not the dog’s normal behavior, and easily recognized, as being a signal that something is wrong. This behavior was well rewarded and hopefully will continue as the dog transitions from training to living with her diabetic person. If you have not taken the time to read up on dog body language and signals, I urge you to browse some titles at the local dog book store or check out some videos on You Tube so you can become familiar with what the dog is saying to you. They certainly take the time to learn all the nuances of our body language, we owe it to them to try and learn theirs. Some dangerous threats to your service dog are apparent: for example, a falling tree or speeding car. There are other threats however, that are not so obvious and it is those I want to focus on for this blog. One danger I see repeatedly at my workshops is a lack of handler awareness. New handlers in particular are so concerned with what they are doing that they forget to watch their dogs. One eye should always be on what your dog is doing, looking for any clue from their body posture as to what they are thinking; in this manner you can anticipate and perhaps prevent a possible catastrophe. It takes practice to develop that watchful eye but it is an essential skill for keeping your dog safe. Dogs are like Hoovers, vacuuming up anything on the ground, whether it is be edible or not. This habit has led to many sick dogs ending up at the emergency vet’s office. Teaching the “leave it” command is useful for avoiding situations where your dog might be eyeing some tempting morsel of moldy spit tobacco wad on the sidewalk like it was a choice filet mignon. There are a couple of ways to teach this, the one I find most useful, however, starts when we are teaching the pups to walk on the lead. I will put a small bowl with a nice treat in it on the ground and walk the pup by it; at first a few feet away and gradually working in closer. As soon as I see the pup starting to look at the bowl I will tell them “leave it” and then ask them to look at me and when they do they get a very tasty morsel. With patience you can get a puppy in one lesson to learn to ignore the food in the dish. With repetition you can teach the puppy to ignore just about anything on the ground and instead look up to you. When you stop to talk to someone, don’t forget to keep an eye on what your dog is doing. They should be sitting or lying by your side. If the person you are chatting with has a dog, you need to be especially careful of a potential conflict between the dogs if one of them offers threatening stares. All these things are related to training and handler experience, for sure, and are pretty straightforward. 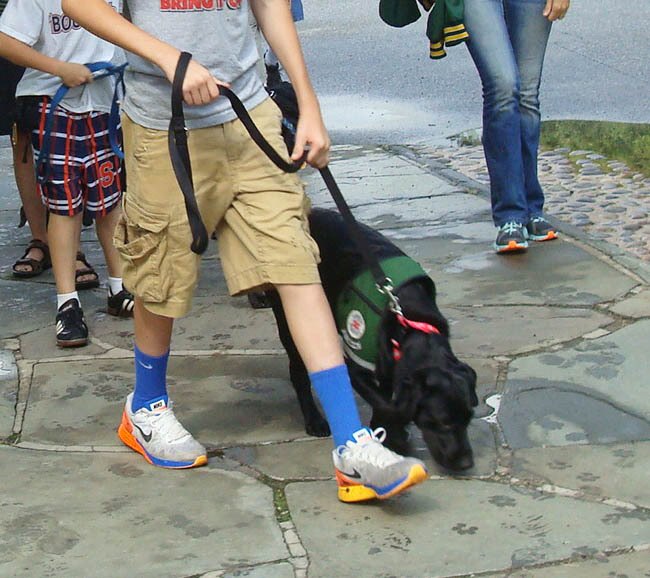 Not so straightforward, however, at least when it comes to training the service dog, is the training of the body. Many programs lack any type of physical conditioning program that allows the dog to be more aware of their body, stretches, and develops muscles and tendons in ways that helps prevent injury and generally keeps the dog more fit. These things become important when a dog has to get into a tight seating space, ride in small quarters in a vehicle, remain for some time curled up in a small space on an airplane or under a table at a restaurant. When the dog gets up, if they are not taught how to stretch and get their body ready for work, there is a strong potential for injury. Sometimes the wear and tear on the body is not apparent with a young dog, but it is very apparent as the dogs get older when repeated bad habits will begin to manifest as restricted movement. I have had several working Labradors over the age of 17 who remained flexible and moving up to their passing. I attribute their good physical condition to breeding but in larger part to an excellent physical conditioning program. 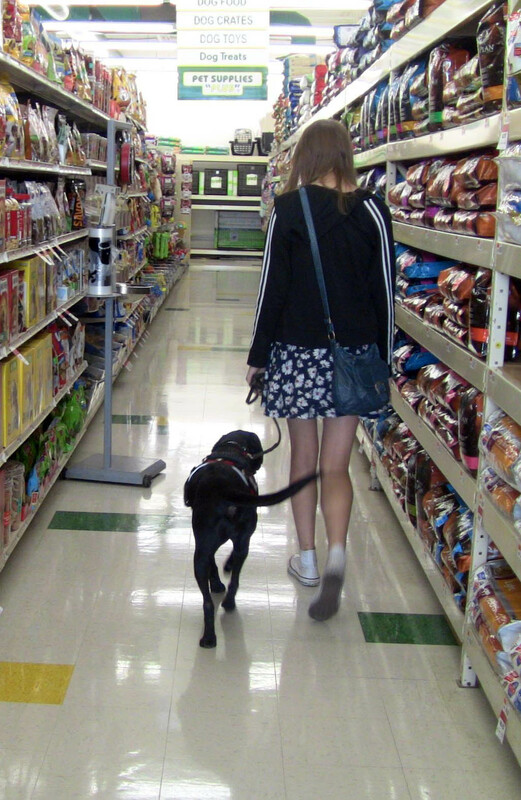 The last threat to the service dog is that of hidden chemical dangers in the environment. As we move into winter, with ice and snow affecting many areas where the service dogs are working, it is really important to be aware of the chemicals used to treat these conditions on the sidewalks and parking lots where we will be walking our dog. Your dog absorbs all these chemicals through their feet, and if they are in a high enough concentration, they can be highly toxic. Sometimes, however, we may not see or realize the residue left on the pavement and this build-up on the dogs’ pads might in itself not be enough to make them sick until they lie down and start to clean their feet. You may want to carry a set of boots for your dog if you live in an area where this is a constant threat to your dog. Other threats in the environment are some types of chemicals that have been used to treat the common areas where we might be taking our dog for exercise or an airing. Most companies that apply chemicals will post flags or signs when it is done, but you can not always count on this, so it is best to stay with areas where you know how they are maintained. Since dogs lie on the floor and are otherwise close to floor all other times, it is also important to pay attention to what is used to clean the floors; the same is true for carpeting. If you are buying new carpeting for your house or office, it would be best to choose a natural fiber and one that is not treated with stain protection. Constant exposure to these types of chemicals are not healthy. You can check on the status of anything you buy by doing an Internet search on the manufacturer’s website. Those few minutes of your time can help your dog live a healthier, longer life. Wishing everyone a joyous holiday season and prosperous new year. When I am training in town, I am always looking for opportunities. A key quality of a good dog trainer is the ability to recognize when you have an opportunity to teach your dog something. I call these moments “recognizing training opportunities”. My husband Sam is a master at this, not to mention he always seems to be in the right place at the right time. One day when he was out running errands he happened upon the Fire Department’s engine company finishing up at a fire scene. Thinking quickly, he stopped and asked if the fireman would not mind if he walked the puppies he had with him around the men and equipment. He explained what the training was all about and they happily agreed. The pups got exposure to scary big men in yellow fire suits and a whole host of smells and sounds. This was certainly a 5 star training opportunity in my book. It would be easy to just drive by a scene like this. However, when you realize this is not something you can easily recreate and is very valuable in the socialization of your dog, then you can appreciate the value of the 5 or 10 minutes spent compared to the bigger picture. Training Opportunities need not be as dramatic as this example to be effective. They can occur around your house and I would guess you miss many of them. A problem for many owners is teaching the stay command. Most people tell me their dogs will only hold a position for a few seconds, not the hours that mine regularly are asked to do. One trick we use to get long reliable stays is to start with the puppy on a leash before we sit down to eat a meal. When we are ready to sit down at the table, the pups all go under the table with the leash being placed on the chair for us to sit on. There might be some squirming at first from the pups, but after several meals they get the hang of what it means to stay put. We build from this to off lead stays and soon they are doing longer and more solid stays. Two things to remember with this exercise; don’t forget the release word like “OK” or “Free” when you are finished. If your pup is in the cranky teething stage while you are teaching this, it is helpful to give them a nice soft teething bone to chew on while you eat. Another opportunity I am on the lookout for relates to teaching the recall. Young pups around 6-10 weeks will naturally stay within a finite distance from you. I let them explore as much as they need to and look for the moment they realize they are a little too far from me. When they turn around, look for and locate me, and the start back in my direction, that is the golden opportunity to teach/reinforce the Recall. I kneel down, open my arms and say “puppy Come”. They will soon learn “come” to mean “come join me” and if you end the whole thing with a lot of love and kisses, your puppy will have a reliable recall in very short order. Always end the recall with something positive. Never call the pup to you to punish him; take him inside, or anything he/she might think of as a negative. If you must go inside after you call the pup to you, do something else before you go inside. There needs to be a break in time and association between the two events. One of the most lost training opportunity I also see is when people come to visit. Most folks raising a puppy will put the puppy up when visitors come. I suggest you need to take advantage of this time to train your puppy instead. Put the pup on a leash and have him sit by your side and greet your guests. Being on a leash he will learn the correct protocol for greeting people coming to visit. It won’t take many times before he gets the hang of it and you won’t need the leash. As tempting as it is, do not let your guests fuss over the pup at the door. They can pet him later, when things settle down if at all. I’m sure if you explain he is in training they will understand. It’s a great chance to develop manners that will make your dog a pleasure to live with the rest of his life. I hope some of these ideas will inspire you to look for those special moments where a valuable lesson can be taught to your puppy. Please share in the comments section, your special training opportunity.